Two Georgia cops who were captured on video punching and kicking a motorist during a traffic stop have been formally charged nearly a year after the original incident occurred. A grand jury filed almost a dozen criminal charges against former Gwinnett County Police Sgt. Michael Bongiovanni and former Master Police Officer Robert McDonald in the brutal beating of 21-year-old Demetrius Hollins during a traffic stop, WGCL-TV reports. Hollins was left with a bloodied, bruised face following the incident, which was caught on camera. Bongiovanni, who is accused of pointing a gun at Hollins, burning him with a Taser and lying about him resisting arrest, is also facing charges of battery, while McDonald, who was seen running up to Hollins, only to kick him in the face while he was handcuffed, is being charged with aggravated assault, battery and false writings. Between the two of them, they were slapped with a 10-count indictment. Hollins’ attorney, Justin Miller, said that the indictment was a good start, but he is still getting ready for trial, as both officers are expected to plead not guilty to the charges. “We know that these two are bad, and we don’t know how many others, so I’m happy there’s a criminal investigation, and they’re going to go to trial so we can see what’s going on,” Miller said. Meanwhile, Bongiovanni’s attorney, Mike Puglise, argued that his client did nothing wrong. “Bongiovanni, in a split-second, highly intense situation of de-escalating the situation, did everything he was trained to,” Puglise told the news station. Last April, cellphone video of Hollins’ treatment started circulating across news stations and social media. 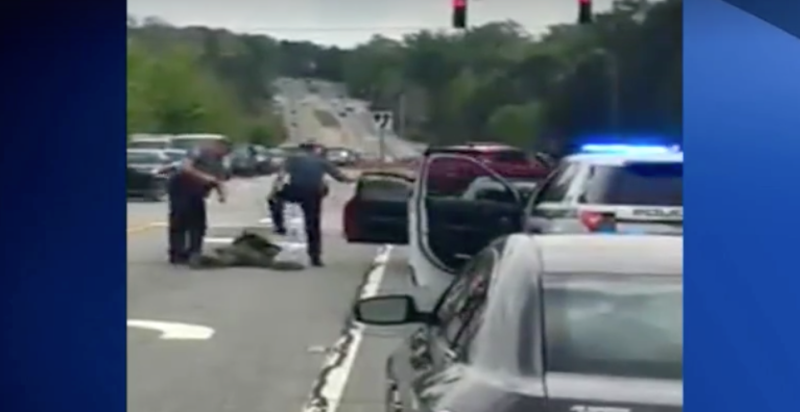 In the video, an officer—later identified as Bongiovanni—can be seen pulling Hollins from his vehicle before dragging him to the ground in the middle of the street. The cop can be seen gesturing to the driver, who rolls onto his stomach before his hands are cuffed behind his back. Shortly after, however, another cop (McDonald) is seen running on the scene and stomping Hollins in his head. Hollins was booked at the Gwinnett County Jail after the incident on charges of possession of less than an ounce of marijuana, obstruction of a police officer and several other traffic citations, including driving on a suspended or revoked license, operating a vehicle with suspended or revoked registration, and failure to signal. His mug shot showed his bloodied nose and lips. The following day, though, both officers were swiftly terminated. Bongiovanni came under further scrutiny after another video surfaced showing him punching Hollins in the face as Hollins had his hands in the air. Hollins spoke out about his encounter with the officers a week later, admitting that he feared for his life when he saw the officers approach him. Hollins, as it turned out, also recognized Bongiovanni from a previous traffic stop back in August 2016. The Gwinnett County solicitor general ultimately tossed out the case against Hollins, along with 88 other cases in which Bongiovanni and McDonald were either principal officers or key witnesses.